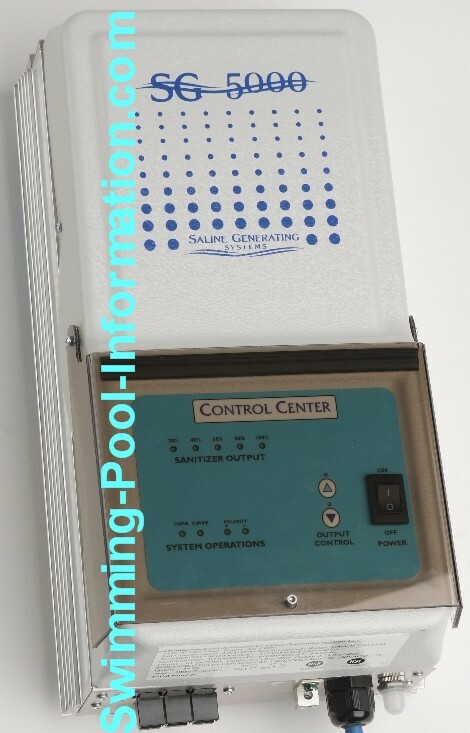 Salt chlorine generators work by converting a low level of salt (less than human tears) into chlorine when the water passes through the cell which gives it a low voltage charge. When the chlorine is used up,it gets converted back to salt. With this type of system,you have less by-products or chloramine by-products to contend with,so less shocking and no burning eyes! 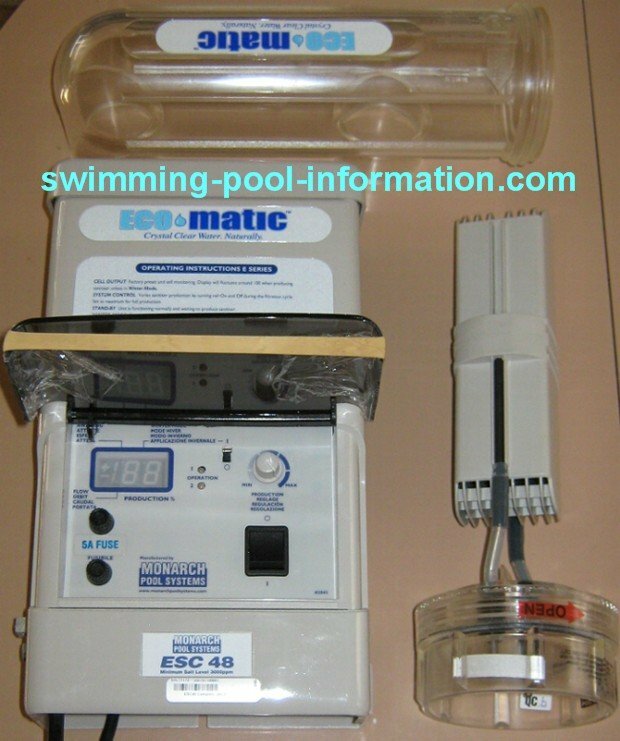 A bigger unit is ALWAYS better....a bigger unit runs less time to produce chlorine so the cell will last longer-even if you have a 20,000 gallon pool consider paying a little more and getting a 40,000 gallon unit. 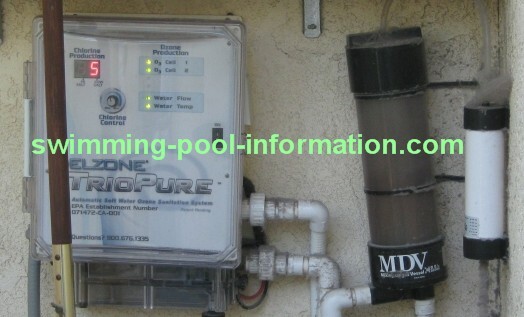 The power module above and cell shown below are by a company simply called Chlorine Generating Systems. The cell plates are far enough apart that you can clean the plates with a stick as shown instead of acid to get a longer plate life (Which probably accounts for 5 year warranty). I have installed a few of these and like them...also,they can be run at a greater range of salt levels than most generators. I can have one delivered to your home at a reasonable cost - they come in 4 sizes (output volumes). The company that originally made the Ecomatic stopped producing residential units,but another company now sells these units - a great stand alone system. 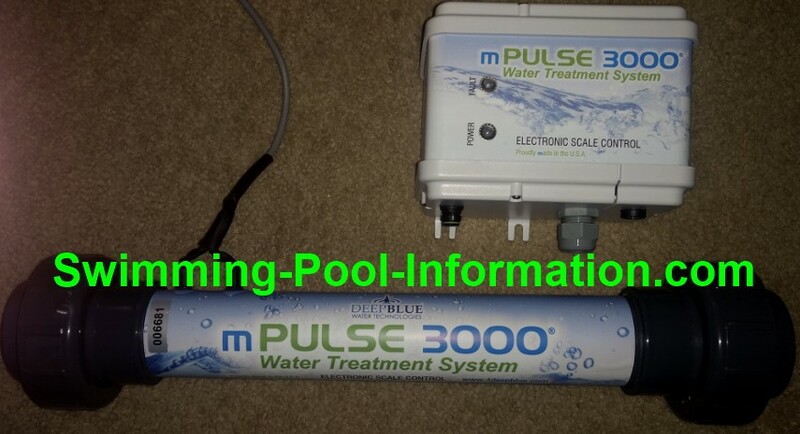 The photo below shows the mpulse 3000 - the cylinder goes on return line to pool and the unit uses low voltage high frequency impulses to change calcium bicarbonate to calcium carbonate to prevent scale...in the pool and on the chlorine generating cell....I am a dealer can have unit shipped to your house. 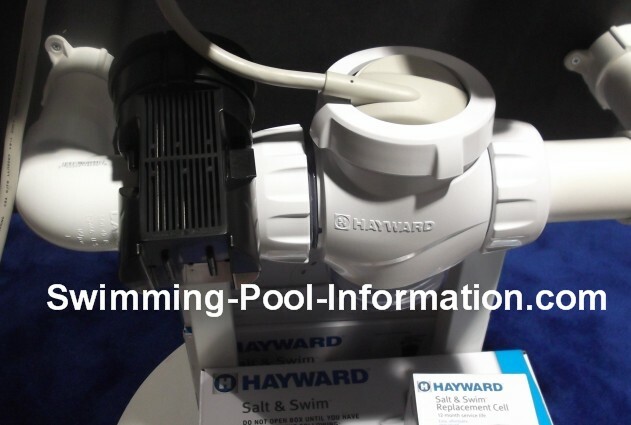 Above is a Hayward unit,also known by the names Aqua Rite and Goldline. Below is a new unit with an inexpensive drop-in cell shown in black that is designed to be replaced every 12 months. 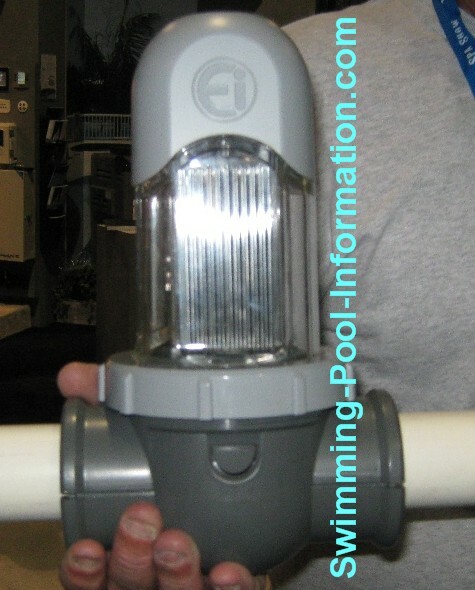 Directly below is the Intellichlor chlorine generator. It interfaces with Pentair Sun Touch/Easy Touch digital controls. It is unusual in the fact that it has a flow switch and trouble shooting lights built right into the cell. Below that is a Jandy cell which interfaces with their controls. Both units can be bought as stand alone units. The unit above is the Aqua Pure Jandy. This unit is very easy to install and remove cell for cleaning and replacement,and the replacement cells are a lot less expensive than most other units. They are for pools up to 35,000 gallons. 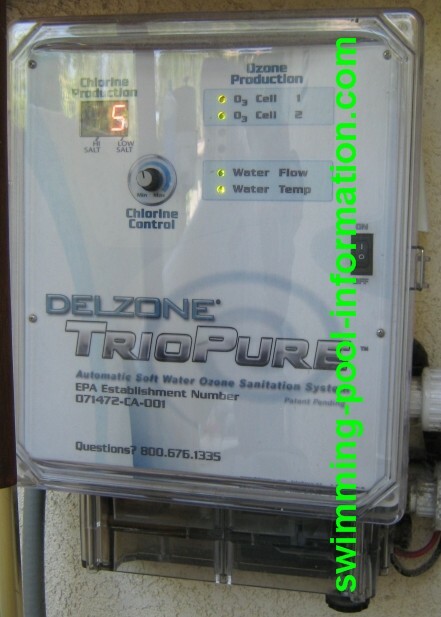 The unit below is the Delzone Triopure which combines salt chlorine generation with ozone. You may be wondering why its not called "Biopure" instead of "Triopure"..I think its because ozone is a three atom oxygen molecule but not sure...ozone is extremely effective as a disinfectant but has a short life (20 minutes) so the chlorine acts as the residual. Above the Delzone Triopure is shown with the mixer (black cylinder) which mixes ozone with water to get saturation. The white cylinder is a dryer,which dries air going into ozone which helps with ozone production by removing excess moisture which can combine with ozone to make an acid (nitric I think) which can damage the electronics of the unit. This is a zinc anode. 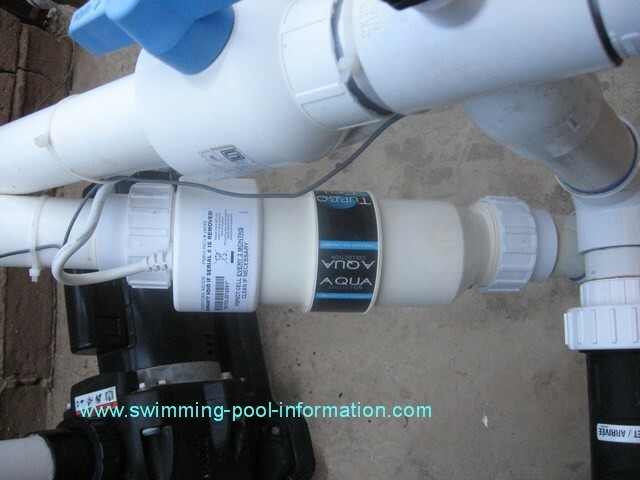 It is a good idea to install one of these with your salt water pool chlorine generator system to protect metal components in your equipment such as the copper heat exchanger in your gas heater. 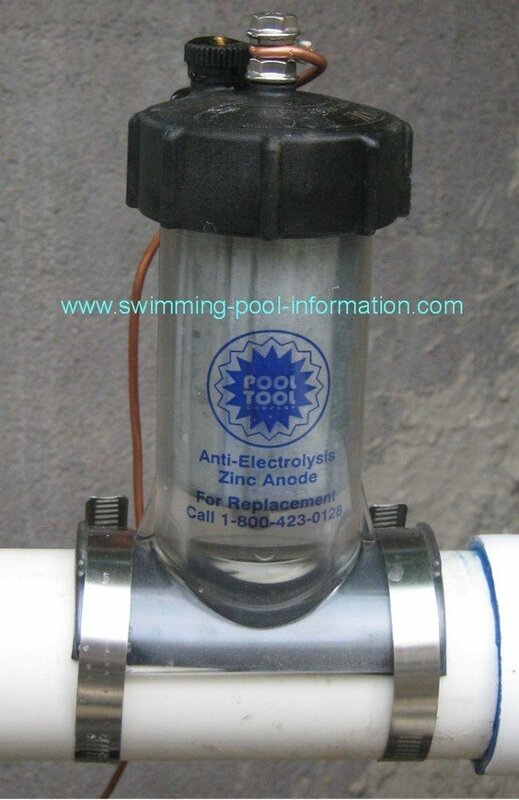 It works by easily giving up its ions to electrolysis in the water caused by the current from the salt generator cell. For this reason,it is known as a "sacrificial zinc anode"....as an additional benefit,zinc works in a synergistic mode with chlorine to make sparkling algae free water! Note:the copper wire going to the top of unit is connected to the bonding wire....in this installation,I also bonded the stainless steel filter to protect it from electrolysis. 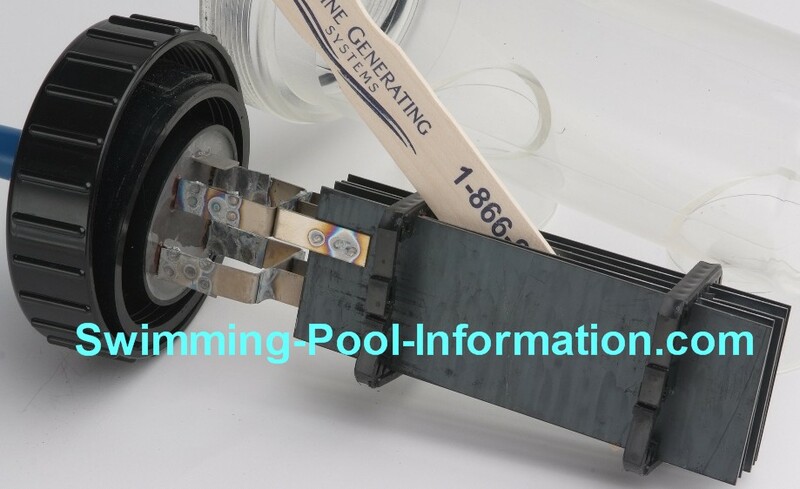 Also having ALL the equipment and pool properly bonded will help prevent electrolysis corrosion.